SINGAPORE - There will be new start times at 13 MRT stations along the North-South and East-West lines from this Sunday (June 5). This marks the first time that MRT stations will start operations later on a Sunday. 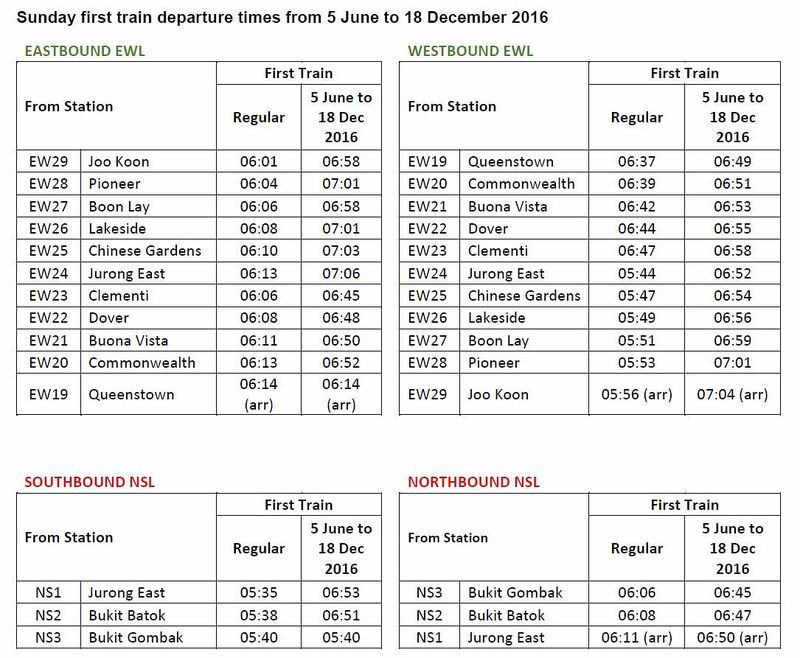 Train services from Joo Koon to Queenstown on the East-West Line, and Jurong East to Bukit Gombak on the North-South Line, will commence at 7am on Sundays, from this weekend till Dec 18. Train operator SMRT said in its reminder on Thursday (June 2) that this will allow its project teams, track patrol teams and maintenance teams 29 additional work nights over the six-month period. The additional time will give engineering staff more time to work on renewal work and maintenance projects, SMRT added. "We plan to intensify our resleepering, resignalling and Third Rail replacement projects as well as carry out routine maintenance work such as track inspections, replacement of track components and the smoothening of running rails using Rail Grinding Vehicles," SMRT's project director (track infrastructure) Roger Lim said. "All these will be carried out concurrently. Track access is precious as such time is limited. We will utilise the opportunity productively." Commuters are advised to consider alternative transport arrangements should they need to travel before 7am. This includes existing bus services to get to other train stations or the Circle Line and Downtown Line for travel towards the city centre. A new paid parallel bus service will ply the route from Joo Koon station to Bukit Gombak station (via Jurong East station) in both directions. The service will operate at 10-minute intervals between 5.30am and 7am on Sundays when the trains are not in service. Fares will be commensurate with the train distance travelled, SMRT said. Existing bus services are available for journeys between the Jurong East and Queenstown stations.